When a woman hears the term natural birth, many words, images, thoughts, and emotions come to mind. For better or worse, from when she was a little girl until now she has been gathering information that has shaped her beliefs about giving birth. Our thoughts, attitudes, and beliefs shape who we are, the choices we make, and how we treat other people. Which brings me to my next point. What Does Natural Birth Mean? In my experience, natural birth can be defined the following ways. A low tech vaginal delivery with minimal or no use of pain medication. A euphemism for a vaginal delivery with or without medical intervention and pain medication. DISCLAIMER: Succeeding at a natural birth is not what women should be basing their worth on as a mother or human being. This way of thinking is extremely dangerous. For example, if a woman thinks she is a good mom because she gave birth without pain medication, I hope she sees this as a red flag and begins to compassionately question her way of thinking. Similarily, if a woman desired a natural birth but didn’t have one, believes she is a failure, I hope she recognizes this flawed thinking as well. Sure, we have ideals we strive towards – they are good and necessary things! However, our performance or experiences do not dictate who we are or our worth. No matter what happens when we give birth, we are always worthy of love and belonging. That being said, if you had a natural birth and want to label it as such, go for it. It doesn’t really matter if it matches up with my or another woman’s definition of a natural birth. You do you. For example, some may disagree with me that my third birth was natural because I used Pitocin, however, I label it as a natural birth. What I think and feel about my birth experience matters more than any spectator’s opinion. The idea that a woman would purposefully choose a natural childbirth may seem illogical to those that have not investigated the subject closely. On the surface, it doesn’t make sense to not use the “get out of jail free” card, if you know what I mean. However, looking closely at what goes along with an epidural will give us a better idea of the benefits of going without (choosing a natural birth). An epidural increases the chance of the following (SOURCE). The experiences of women that choose immersion in water, a common method of pain management with non-pharmacological births, tell us even more regarding the benefits of a natural birth (SOURCE). Also, women choosing a natural birth tend to choose upright laboring positions for comfort and pain relief. Women that choose high tech births or pain medication, for the mother’s safety or the efficacy of the medication, are more often than not, lying down. Laboring in an upright position has benefits as well (SOURCE). The benefits of a natural birth include a faster, safer, healthier, more satisfying, and less complicated birth. It makes sense that a natural birth is an attractive option to many women. Now that we better understand the logic behind a woman’s choice to give birth naturally, very pertinent and personal questions come next. By choosing to give birth without pain medication, what exactly are we signing ourselves up for? 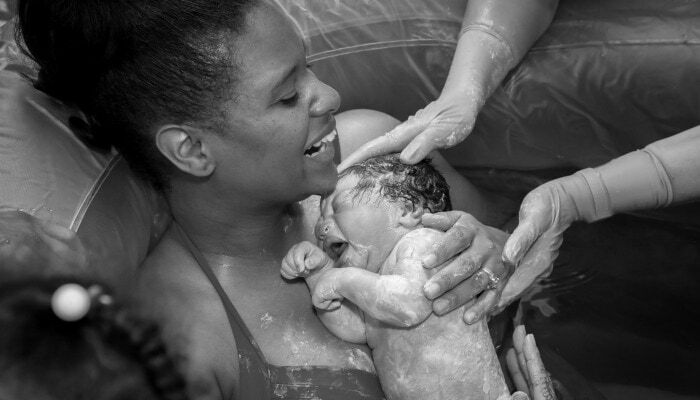 What is the natural birth process and what does natural birth feel like? What is the Natural Birth Process? If you are wondering what labor will be like, check out my post called the doula’s guide to the stages of labor! The following is an excerpt from that article. The first of three stages in the stages of labor is devoted to powerful contractions that open the cervix to 10 cm but also position the baby in the best position for the next stage (pushing and the birth of the baby). Active labor is when the cervix has opened to 6 centimeters (give or take), contractions are around 3-5 minutes apart and each contraction is about 60 seconds long. Timing contractions is helpful to determine when to go to the hospital. At this point many women head to the hospital for labor. Transition is the shortest portion of stage 1, but often the most challenging. Contractions are around 90 seconds long, 2-3 minutes apart and the cervix is 8-10 cm dilated. Typically, transition is when women “give up”, ask for epidurals and say “I can’t do this anymore.” Birth plans fly out the window, and women look for a way out. Women feel hot, cold, sweaty, nauseous and may even throw up. For a more detailed post and MUST READ information about transition and how to cope, check out my post called how to get through transition without an epidural. How Painful is a Natural Birth? What Do Contractions Feel Like? Now that we have a better idea of how birth unfolds, let’s dive in a little bit deeper and talk about the pain of natural childbirth. A great place to start is to describe what labor contractions feel like. If I were to explain what contractions feel like to a person that has never experienced menstrual cramps, this is what I would say. These are some other words and phrases women have used to describe what contractions feel like. In early labor some women experience pain and pressure in their back, or in the lower abdomen, and some experience both. Some women describe early labor contractions like mild to moderate period cramps. To read more in more detail about what contractions feel like, head on over here for the full report. Yep, natural birth is hard. Labor is hard work, it hurts, but you can do it. Giving birth to my children is one of the hardest things I’ve ever done but completely and totally worth it. If you’re looking for natural birth stories to read, here’s my first birth story (birth center). Here’s my second (home waterbirth). And my grand finale, a homebirth transfer to the hospital extravaganza. In my experience, wishing or hoping for a natural birth is less effective than planning for a natural birth. Most women need to actively work towards achieving a natural birth, especially when birthing in a hospital. Can I Have a Natural Birth Without Classes? Yes. Women can absolutely have a natural birth without classes. Do I recommend planning for a natural birth without classes? No. Don’t take my word for it! Head on over here to read the reviews from some of the women that have taken my childbirth classes. Scroll allllll the way down. Can I Have a Natural Birth Without a Doula? Yes. Women can absolutely have a natural birth without a doula. 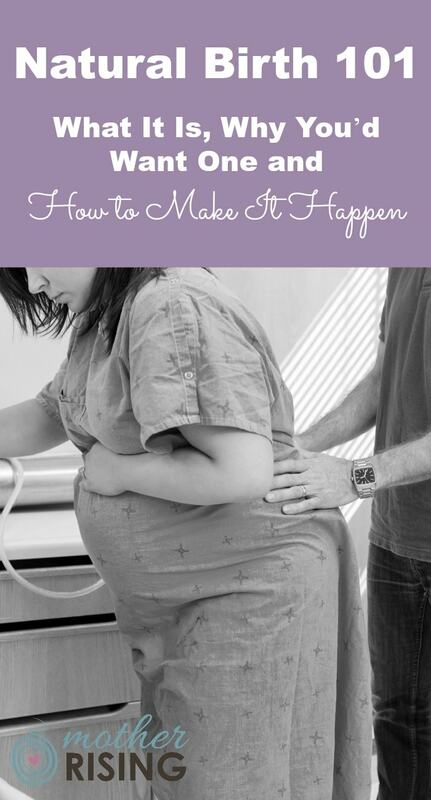 Do I recommend planning for a natural birth without a doula? No, especially if you’re planning to give birth in a hospital. This research study even showed the babies born with mothers receiving support from a doula had better five minute apgar scores. How cool is that?! Can I Have a Natural Birth in a Hospital? Yes. Women can absolutely have a natural birth in a hospital. In fact, most hospital births I attend as a doula are natural! That being said, however, most hospital births are not natural. The reason why most of the hospital births I attend are unmedicated is because they have planned for a natural birth including hiring a doula to help make it happen. In my experience, to increase the chances of having a natural birth in a hospital a quality care provider, childbirth class, and doula are usually involved. Can I Have a Natural Birth Without Tearing? Yes. Women can absolutely have a natural birth without tearing. In my experience, I find that unmedicated women (that are not numb) have more ability to push in ways that decrease their chance of tearing. To read an in-depth article about how to prevent tearing at birth, head on over here. 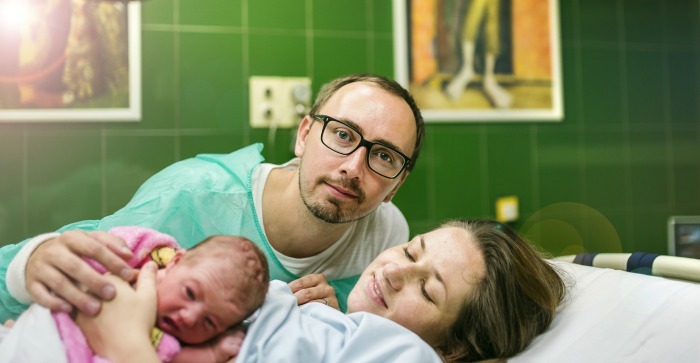 Can I Have a Natural Birth After a Cesarean? First, it’s important to assess what resources your particular community has. For example, are there care providers in your area that support a VBAC? Is there a local chapter ICAN meeting to attend? Second, it’s important to become educated on all aspects of VBAC birth. Check out this VBAC book list to get started. Third, check out these 10 tips for a successful VBAC that will help you to feel more prepared, confident and emotionally present as you enter your birth experience. Can I Have a Natural Birth With Pitocin? However, the odds are stacked against you. For most women, the contractions caused by the synthetic hormone Pitocin are longer, stronger, and closer together than the contractions caused by oxytocin. Also, the body does not release the pain coping hormones endorphins in the same way, which leaves a woman with more difficult contractions and less ability to cope. This is where having taken a quality childbirth class, hired an amazing care provider along with the support of a fabulous doula are invaluable! If you think you might be one of the many fearful pregnant women of our culture, what are you to do? Is the fear and distrust so ingrained in you that nothing can be done? Absolutely not. How to Give Birth Without Fear: Here are my suggestions on how to combat the conscious and sub-conscious learning that IS NOT WORKING FOR US. In my years of birth work I have heard my fair share of golden nuggets said to laboring moms. Some things were truly golden nuggets – amazing, encouraging words spoken that were very helpful. And some were the other kind of golden nugget, likely coming from a good place, but nonetheless, unhelpful. Read this blog post to learn all about the latter nuggets also known as things to NEVER say to a woman in labor. This is one of the most bothersome things on the list of things to never say to a woman in labor. If you take away one thing from this article, this is the one. I have heard this phrase said to women in two scenarios. Scenario 1 is when a laboring woman is trying to decide whether or not to get an epidural and scenario 2 is after a laboring mom has received an epidural. And just for fun, here’s a short list of celebrities who’ve had a natural birth. Birth is an experience a woman will remember for the rest of her life. Because birth is so profound and far reaching, it makes sense that women spend an incredible amount of time and energy to plan for a good experience – for herself, her partner, and baby. The benefits of a natural birth include a faster, safer, healthier, more satisfying, and less complicated birth and can be a wonderful option for many women (including celebrities!). Birth is hard work, it hurts but with good preparation and support is totally possible – no matter how things unfold. You can do it! Leave a comment and let me know your experience with natural birth. I can’t wait to hear from you! Thanks for this great article. I am 31 weeks pregnant with my 2nd child. I attempted a natural birth with my first and ended up getting an epidural (for a variety of reasons) and then having complications that led to a 5 day stay in the NICU for my son. I am struggling with anxiety about giving birth again, not being able to cope with the pain and having interventions that may increase risk to my baby. I just don’t know what to do. I want to try for a natural birth again but I’m terrified. I say interview 2-3 doulas. That would be a good first step in gathering information. You can do it! I’d like to take a birthing class and hire a doula, but I live in Puerto Rico and my Spanish is limited I have searched for a doula/midwife, but I’ve been pretty unsuccessful so far. Do you have any suggestions? Have you looked at http://www.doulamatch.com?